Are you interested in learning more about wine and wine tastings? Maybe you want to host a tasting party or wine theme dinner party? Initially, the world of wine and wine appreciation may seem intimidating. Thousands of years of history, thousands of types of wines and wine producers and so many rules about how to serve wine and how to pair food and wine...its enough to make the timid run and hide! But wine tastings and fine wine appreciation does not have to be scary or intimidating! The most important thing to remember is that food and wine are pastimes of leisure and pleasure and therefore not something you should stress about. Everyone can begin the process of learning about wine and how to taste wine at their own pace and in their own style. 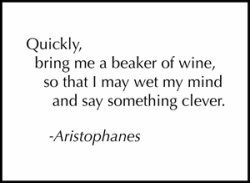 While some of you will become swept up in the passion and excitement of the world of fine wine, others will prefer to go slowly, simply enjoying wine occasionally. Either way, it only takes a bit of introduction to get you started and feeling comfortable about tasting and assessing, discussing, and serving wine. Why does wine deserve your attention? Well, if you found this site then likely you already know. 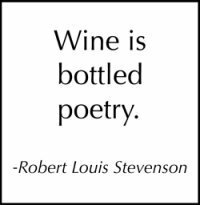 However, wine is so much more than a beverage. At its best, it is a work of art, capable of ever-changing complexity and beauty. It can also be intellectually satisfying, offering a lifetime of potential learning about wine producers, vintages, regions, grape varieties, food and wine pairing, etc. Beyond all that, wine simply tastes good and is fun. it is romantic, seductive and mysterious. It can be everything from elegant and sophisticated to rustic or hedonistic. Wine, in moderation, can even be good for you! Besides all the above, a few glasses of wine at a wine party lubricates the mind and tongue, leading to great conversation, joyous frivolity and lots of fun! Therefore there are so many reasons to love wine and this site is devoted to enjoying wine in many different settings. Whether you are a wine newbie eager to learn more about the nectar of the gods, a keen entertainer looking for ideas on how to host a wine tasting party, or a seasoned eonophile looking for new ideas for themes for tastings, we are here to share out knowledge with you. We'll even share some info about wine accessories and pairing food and wine. We, your hosts, have been enjoying wine and hosting tastings and wine tasting dinners for years. We have a passion for wine and for food and we are here to share our experience with you and help your next wine tasting event to be a smash success! Submit your favorite wine-related photos to be featured on this site! Submit Your Wine Photo Here! What's New at the Wine Tastings Guide? Check here regularly for the newest additions to the Wine Tastings Guide website! Here it is, Wine 101, an introduction to wine for beginners! Well the world of wine and wine tasting doesn't have to be intimidating. You can easily start down the road to being a true aficionado. There are many types of wine or wine styles which are produced throughout the world. Learn about what the differences are in terms of production, style, flavor and food pairing! There are hundreds of grape varieties grown in the world, many of which are used to make wine. Learn more about some of the most popular types of grapes used to make the world's most famous wines. Are you new to wine tasting? Do you want to learn how to taste wine? This is a good start to begin learning bout wine and wine tasting. Hosting a wine tasting is one of our favorite ways to entertain. We have all you need to get you started so that you can plan a home wine tasting. So you want to learn about wine? Well the first step is to learn how to taste wine properly so that you can get the most out of each new wine experience. Learn all about tasting wine here. For the beginner, serving wine can be daunting. But it doesn't have to be! Here are a few tips on how to serve wine to make your first wine tasting a success with each wine showing optimally. When hosting a wine tasting, there are several types of wine tasting themes you can use to make your wine tasting party more fun and entertaining. Food and wine pairing is an art. The perfect combination of flavors in wine can highlight and harmonize with the flavors in your food, making the overall experience greater than the sum of its parts. Cheese and wine are a match made in heaven. Here we share tips on wine and cheese pairing, from classic pairings like Port and Stilton to general concepts about serving cheese with wines. Wine tasting tours of any wine producing region can be very educational and a whole lot of fun! We will take you through the ins and outs of wine country, how to plan your trip and some tips. There are many French wine regions producing beautiful and diverse wines from around the country. Learn more about them here. Here is an introduction to Italian wine regions, covering the various regions and sub-regions that make various styles of wine. Here is a review of wine accessories which will help in your serving and enjoyment of fine wine. What would a wine tasting guide be without some wine tasting notes? Here we get to play wine critics! We think it is also helpful as examples of how to describe wines. Why should you want to learn how to make vinegar? Besides being a good use for left-over wine, when you make wine vinegar yourself it results in much better vinegar than you can buy in most stores! People always want to know if there are any health benefits of wine. The answer is almost certainly "Yes", but there are also risks! Come check out some of our favorite wine tasting links. If you are interested in linking to us or want to exchange links we would love to hear from you! Search all the pages of the Wine Tastings Guide. Josh Dusick has been passionate about wine and food for a long time. That’s why he started the Wine Tastings Guide, to share his excitement and knowledge with you! Contact Wine Tastings Guide with your questions and comments. We are here to help! Submit your favorite wine photo here! The best wine-related photos will be featured on our free newsletter.